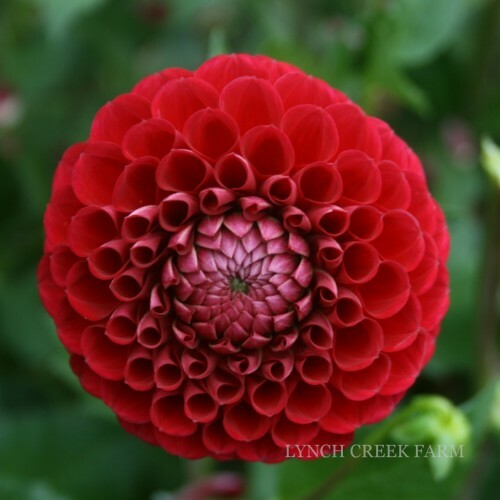 Cornel is a mainstay at the Farm, a deep red ball dahlia with superior petal structure that provides a focal point for late summer and autumn bouquets. Four-foot plants produce long-lasting four- to five-inch blooms on amazingly long, strong stems. Cornel blooms comparatively late in the season, but the Lynch Creek crew calls it well worth the wait. Coralee is the perfect flower for summer bouquets or weddings. 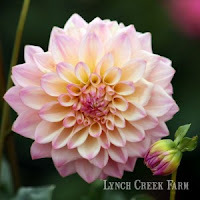 A light blend of lavender and cream with overtones of pink, its formal decorative blooms are four to six inches across. 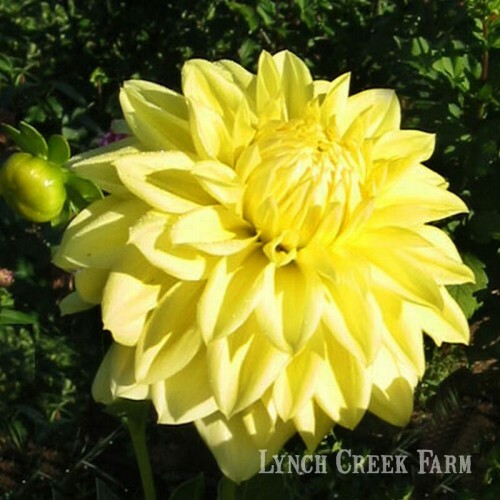 The crew at the Farm calls Coralee a great all-around dahlia, good as a cut flower and garden flower as well, in a very desirable color. It grows on a 3.5-foot plant with plenty of blooms. Ginger Snap pleases growers with abundant flowers on a leggy four-foot plant. Four- to five-inch waterlily-shaped blooms are blended butter-yellow and gold hues like late-summer sunshine. Abundant lateral growth on the plants provides dozens of blooms all season. Ginger Snap is equally useful as a garden feature or a cut-flower plant. James Albin bears quantities of large, bold, true yellow dahlias of the formal decorative type. Blossoms are six to eight inches across, striking in the garden at 4.5 feet, and good for cutting as well. Wind and rain can damage this one late in its long blooming season, but it's a true standby for dependable form and color. 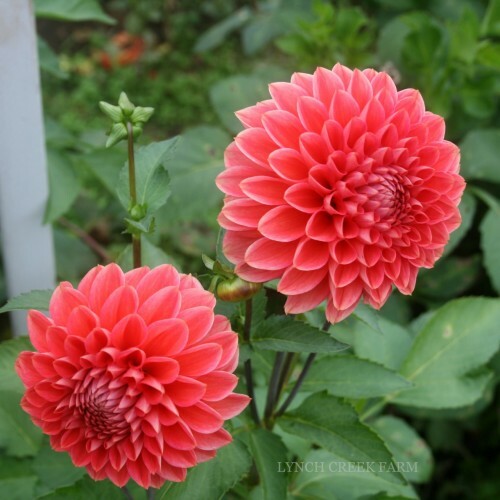 Tempest has intense tones of coral, orange and red in a formal decorative dahlia with blooms four to almost six inches across. While its stems aren't long, it's still a great cut flower and its color makes it a brilliant addition to the garden border. Plants grow to four feet and bear lots of blooms. Maarn combines incredible color with long, strong stems, making it a must-have for cut-flower use and a stunner in the garden. 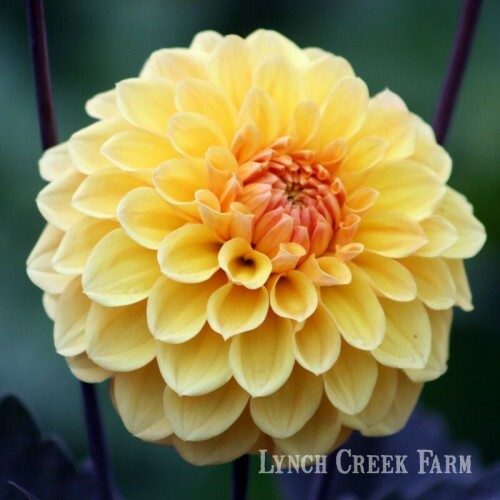 Andy calls it "easily the best orange" at the Farm; its soft color makes it super in mixed bouquets. 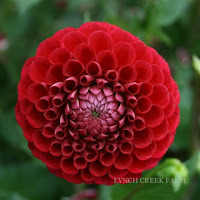 Another formal decorative dahlia with a deep round shape, it's about five inches across. Plants grow to four and a half feet. Midnight Sun shines bright in the garden. Showy bright yellow formal decorative dahlias show peachy overtones accented by dark foliage. An exhibitor's dream, this is an incredible garden dahlia. Blossoms are four to six inches across; plants grow to three and a half feet. Fully mature blooms sometimes appear darker in the center. Kasasagi produces "tons" of two-inch flowers each season on a three-foot bush. 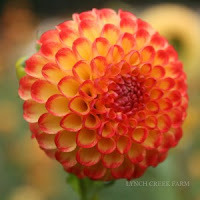 An attractive pom pon dahlia, it combines red and yellow in a neat round bloom and is always popular for cutting. Its color makes it a desirable border plant as well; it's no wonder Lynch Creek has a hard time keeping it in stock.